When fishing the lower Deschutes for the salmonfly / stonefly hatch event, there are some proven fly patterns that many experienced Deschutes anglers would have high on their list. The Norm Woods Special is a fly pattern that may be the highest on many people's list of proven patterns to bring for the Deschutes stonefly extravaganza. It is more or less a stimulator gone different, and that is with the wing and often it has no tail. I would simplify my statement and I would say that the Norm Woods Special is a calf tail stimulator with no tail on the fly. That is what separates it from the standard Kaufmann's Stimulator. 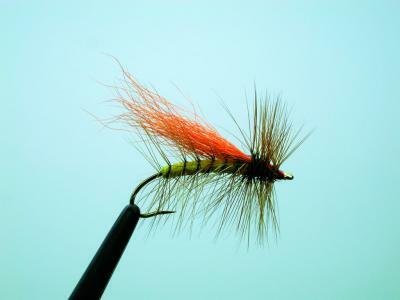 For whatever reason (the wing color and body color - most likely), large wild rainbow trout love eating this fly, and it is a must for your arsenal. The Norm Woods Special is a standard fly you should have in your fly box for any golden stonefly situation. It has proven itself over and over as a true trout catcher. Tie up for your Deschutes stonefly fly fishing trip, and you will see some vicious takes! I have discussed your posts with my friends, they have also watched these posts and they have also like these posts very much. Like me my friends also started taking more interests in carp fishing before that, they do some other fishing but after watching your posts they have said that now they would do only carp fishing and nothing else. I love carp fishing madly and your blog is very informative and great . and all the picture in your blog is fabulous and every one like this who are intrusting in fish and fishing like me keep it up and keep sharing such a great and awesome information about fishing thanks.